Porta -A -Shack designed by K5VXT and VK2ACM. The Porta - A - Shack in a waterproof case. This project was designed and built by Rick K5VXT and Clint VK2ACM. 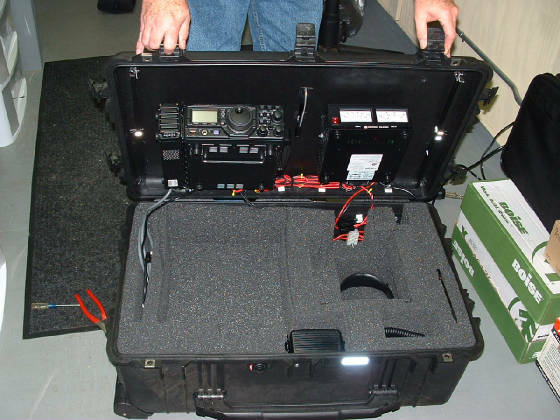 Rick and myself decided to build a shack for portable, emergency or field day excercise,we decided upon a sealed case built by Pelican. 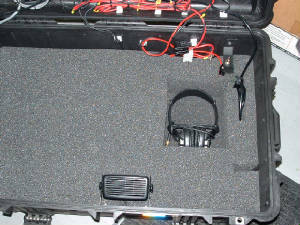 The end result was amazing, It can be powered by electricity or battery power.The case incorporates a Yaesu FT 897 and a switching power supply, battery posts at the rear of the case have been installed for the battery to clip onto a switch inside the case allowing the operator to switch from either power source. Our first contact with the Porta - A - Shack was with Steve KB0UZR in MN he gave us a 5/7 to 5/9 report,Rick and i were amazed at the report with such a simple installation. While Rick was talking to Steve I rotated the antenna to see the difference,Steve was very supportive of our tests and we concluded that this simple station was a great success for any ham to incorporate for any application. Thank's to Steve KB0UZR for his assistance with the reports . 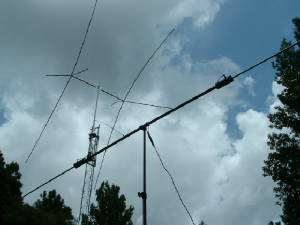 Below W6HFP, K5VXT, VK2ACM, W3FF. Below the buddipole and Lightning Bolt Quad. 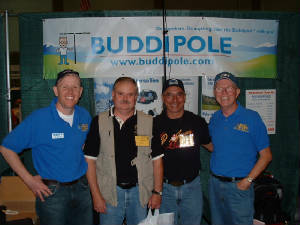 The W3FF BuddiPole click pictur to link to W3FF website. (Below)The Porta- A - Shack nearly finished just a few more final touches. 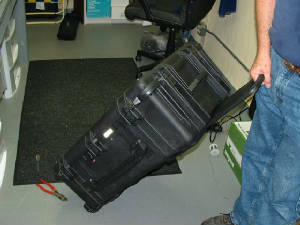 (Below) Rick shows how portable the station really is,the case has six safety locks and a pull out handle for easier mobility. The Port-A-Shack ready to go anywhere. The picture above is the finished product,the Porta -A- Shack. Please click on the picture above to take you to the pelican website. 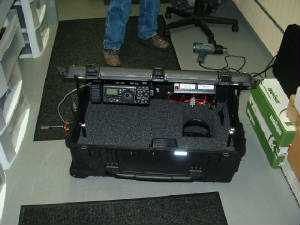 Click here for additional documentation for the FT897. 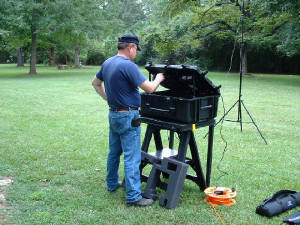 Pelican Case Web site. Click here to go to the site. I hope that you enjoyed this project as much as Rick and myself enjoyed building it.